An impressive modern detached family house located on the popular Grosvenor Park development just off London Road on the south side of the town and provides convenient access to the recently opened Rosecroft Primary School also on London Road. The property was built by Taylor Wimpey approx. 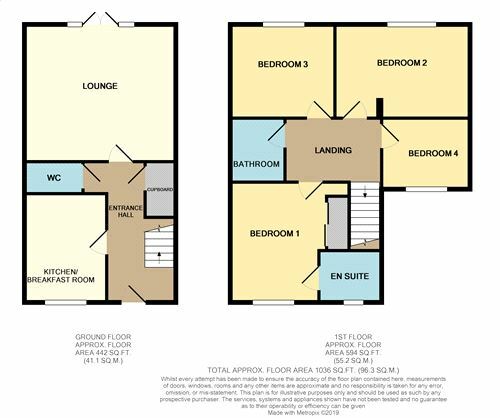 4 years ago and provides spacious family living accommodation throughout including 4 bedrooms leading off a landing, a stylish fitted kitchen/breakfast room with room for a small table and chairs off the entrance hall and a lounge. Outside the rear garden is neatly laid to lawn with a car port and driveway to the side of the house, the property is presented to an exacting standard of neutral décor throughout and will impress on viewing. From our offices proceed round the one way system and into the High Street continuing into London Road, continue past the Police Station, then take the 2nd turning on the right into Goldfinch Drive, then 1st left into Speckled Wood Close where the property will then be found after a short distance on the right hand side. Front entrance door, stairs to first floor, radiator, under-stair space, and cupboard tiled flooring. Comprising w.c., wash hand basin, tiled flooring, radiator. 15' 6" x 14' 1" (4.72m x 4.29m) Double glazed French doors to rear garden with adjacent side panes, radiator. 15' 6" x 10' (4.72m x 3.05m) Fitted in a range of stylish matching units with fitted work tops comprising sink unit, built-in gas hob with electric double oven beneath, stainless steel splash back and canopy extractor hood above, integrated dish washer, washing machine and tall fridge freezer, wall mounted gas boiler housed behind matching wall cupboard door, radiator, tiled flooring. Radiator, recessed ceiling down-lights, access to roof space. 12' 2" x 9' 1" (3.71m x 2.77m) Radiator, freestanding double wardrobe cupboard with mirror sliding doors. Walk-in shower cubicle, w.c., wash hand basin, chrome towel rad, recessed ceiling down-lights. 13' 10" x 9' 7" (4.22m x 2.92m) Radiator. 11' 9" x 9' 7" (3.58m x 2.92m) Radiator. 9' 1" x 7' 3" (2.77m x 2.21m) Radiator. Fitted in a stylish suite comprising bath, wash hand basin, w.c., recessed ceiling down-lights, radiator. The front garden is laid to lawn with shrub planting, a pathway leads to the front door with an adjacent barked bed, to the side is the driveway leading into a car port, a side gate leads off the driveway and into the rear garden. The rear garden is enclosed by fencing and is laid to lawn with a paved patio and pathway.